The number of women in STEM is of continuing concern for educators and governments internationally. Despite a huge amount of research and high exposure campaigns, a disparity still exists between men and women in STEM fields. In the US, it is estimated that the percentage of women working in computing, engineering, and advanced manufacturing has seen no growth from 2001 to 2014. In fact, two of these sectors actually saw the number of female workers fall by 1 percent over this period. Considering women make up 47 percent of the overall workforce, these figures are alarmingly low. Even when taking into account all STEM occupations, including physical and life sciences where representation is higher, women still only made up 24 percent of the core workforce in 2015. But why does all this matter? What’s so great about STEM jobs anyway? Firstly, women in STEM enjoy a 35 percent premium on earnings compared with their non-STEM counterparts, so increasing representation in these fields is key to improving wage equality in the labor market. Additionally, STEM jobs are projected to grow at nearly double the rate of non-STEM and enjoy half the unemployment rate. Therefore, they provide much better future employment prospects in a time where many jobs face the threat of automation. So, if STEM occupations pay so well and offer greater job security, why aren’t more women entering them? The answer to this question is a complex one and the topic of much debate and ongoing research. Probably the most extensive evidence that refutes this theory comes from a research program carried out by the OECD called the Program for International Students Assessment (PISA). This extensive survey has been assessing the science, math, and reading ability of 15-year-olds in a total of 72 countries around the world since 2000. The most recent PISA survey in 2015 found little difference in science performance between boys and girls. On average, boys outperformed girls by just 1 percent and scored higher in 24 of the countries assessed. However, in 22 countries, girls actually outperformed boys! When it comes to math, the PISA survey found, on average, boys outperformed girls in all countries tested. However, this was only by 2 percent and certainly does not explain the huge shortage of women in STEM careers. Furthermore, a meta-analysis summarizing data from 242 studies on math performance in the US found no significant difference between genders. Many other studies have shown similar results. If research shows there is little difference in science and math ability levels between boys and girls, there must be other factors at play here. Despite huge progress in recent years, gender stereotypes in society are still alive and strong. We’ve all experienced it at some point. Dolls for girls and building blocks for boys. Pink is a girl’s color ,and blue is a boy’s color. While this may seem harmless, it would appear we are only just beginning to understand the true impact, especially when it comes to child development and education. Gender stereotypes are often set in early, with girls thinking math and science are ‘boy’s subjects’ as early as second grade. These ideas continue to grow, influencing everything from test scores to career choices. So, rather than a lack of ability, it is the belief that these subjects are not for girls that results in fewer women pursuing STEM subjects. This belief is so powerful that even in Sweden, one of the most gender-neutral countries in the world, a shortage of women in STEM still exists. Researchers found this was mostly due to girls’ low self-efficacy rating for STEM subjects which deters them from studying them. The lack of women in STEM is clearly a complex issue, and we have barely even scratched the surface. That said, there are several simple solutions that educators can implement to improve the learning environment for girls and ensure equal opportunities for all. Reassurance – Fascinatingly, research has found that when girls were told they were just as capable of achieving good math grades as boys, differences in scores practically disappeared. This is linked to a phenomenon known as “stereotype threat” whereby anxieties about conforming to stereotypes result in students performing poorly in tests. Simply reassuring girls that they are just as capable can help to alleviate this, but educating students about stereotype threat has also proven to be useful in overcoming it. Role Models – When it comes to encouraging girls to pursue STEM careers, female role models have been shown to be highly influential. There are many ways to introduce girls to inspiring role models, such as bringing in local speakers working in STEM fields or promoting female innovators and tech leaders in class. Role models can also include student mentors, so you could use coding and robotics kits to start a workshop where older girls tutor the younger ones. Reduce Stereotype Bias – Even if you might not think it, there is a good chance you hold some kind of implicit bias about gender, sexuality, age, or race. This doesn’t make you a bad person! Our brains are hardwired to make quick decisions, i.e. form stereotypes. What matters are the steps you take to reduce biases that can form as a result. Take the implicit bias test designed by researchers at Harvard to see where your stereotypes lie. Ask yourself how these biases affect how you view, evaluate, or teach students, and then look for ways to make improvements. The above pointers are just a few simple ways that educators can help foster an environment that stimulates girls to pursue STEM subjects and careers. For more research-backed recommendations, check out this groundbreaking report by the American Association of University Women. This is a guest blog by William Asbury. William is the founder of STEMToyExpert, an educational resource designed to improve Science, Technology, Engineering and Math learning for all age groups and genders. He is passionate about the positive applications of technology in education and is an advocate for an evidence-based approach to learning. William has devoted much of his work toward researching and promoting equal representation for women and ethnic minorities in STEM. As I have said before, I love working in the brick and mortar building of TCEA HQ, but it is also invigorating to get out on the road. The best part of workshops is connecting with teachers. I love hearing what their students are learning and what technology they are using to get the learning accomplished. I wish I could remember which fantastic educator shared this activity. So if by chance you are that educator . . . thank you for sharing Save Fred. Fred is a worm who likes to take his boat out on the water. However, we know that worms cannot swim, so Fred practices safe boating by wearing his life preserver on the water. BUT, tragically, Fred’s boat has flipped over. Fred landed on top of his boat and his life preserver bounced under his boat. It is your mission to SAVE FRED. Check out this video by Mr. Pearson for the story setup and directions on how to save Fred the worm. The video length is only 1:42. Make sure you watch to the very end. Mr. Pearson used Chatterpix in a very creative way. Beth and Rowdy = Success! How can your group save Fred? 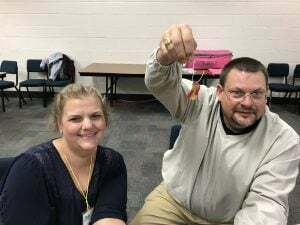 Your group can only use the four paperclips to accomplish this mission: You need to get the life preserver on Fred and get Fred back in his boat, all without touching Fred, the boat, or the life preserver. It would also be great if you did not injure Fred. Do not stab him with your paper clips. Two tips from Tessa Stow, a fifth grade teacher in Hereford ISD who uses Save Fred as her first science lab every year. Try this challenge non verbally. Use a digital storytelling tool to create a story about Fred. Try out. Toontastic on a Chromebook or Book Creator on an iPad. Try Adobe Spark Video to create your own Save Fred video. Use Flipgrid to record group reflections. Use Popplet Lite, Microsoft OneNote, or Google Drawing to flowchart the process. Check out this free resource from Purdue EDU. Create your own ChatterPix Kids. Four easy steps are listed below. The Chatterpix Kids app is made by Duck Duck Moose for iOS devices and is free. It is geared for ages 5-12, but even high schoolers enjoy using it. Draw a line to make a mouth. Share the Pix with friends and family. I would love to hear how your Saving Fred adventures are going. Email me at [email protected] and share your Fred stories. If you are teaching with an iPad and need to “appify” science instruction, consider these apps for your classroom. This collection includes reference guides and games. Each intends to engage students with visuals, videos, and interactive elements. The cost appears after each app. If no cost appears, the app is free. Bloom ($4.99): See how plants spread their seeds. Field Guide for Lepidoptera: “Lepidoptera is an order of insects that includes butterflies and moths” (Source). This is a field guide. Mammals ($2.99): Explore this interactive guide that shows how mammals play, grow, see, eat, move, and feel. Nature Guides: Find out more about birds, butterflies, moths, dragonflies, and damselflies with these informative color guides. Science 360: A reference guide for current science news featuring images, videos, and text. Science Glossary: A glossary of scientific terms and short biographies that support a science education website. All definitions link to related terms and to free, detailed science learning modules. It is geared for secondary students to use via the web. The various components are fine for anyone interested in science. Weather Line ($1.99): See this infographic maker for your local weather. World Wildlife Fund (WWF) Together: See endangered animals via images and read about them. The app features interactive elements. Ultimate Dinopedia-Complete Dinosaur Guide ($4.99): See 700 dinosaurs with National Geographic’s interactive Dinopedia. DragonBox Algebra 5+ ($4.99): “DragonBox Algebra 5+ Is perfect for giving young children a head start in mathematics and algebra. Children as young as five can easily begin to grasp the basic processes involved in solving linear equations without even realising that they are learning. The game is intuitive, engaging and fun, allowing anyone to learn the basics of algebra at his or her own pace.” There is also a DragonBox Algebra 12+ ($7.99). Find a wealth of other apps online. It may sometimes appear difficult to incorporate non-game apps into your regular lessons. The standard use for these apps involves students exploring a specific topic. These work well as research apps. This approach does work. Students may tire of only using apps for research. Ask students to determine what has been left out of the app. Create situations where they can research that information themselves. Students can share their findings via a new Google Site or OneNote Notebook. Suggest students think about a different way to group the content in the app. Prompt them to think about what new topics might be included in the future. Take the app-based information to the next level of Bloom’s for greater engagement. There are many online resources featuring iOS apps. What are some of your favorites? The LEGO MINDSTORMS EV3 tends to get all the glory, but it is time to give some props to its little brother, the WeDo 2.0. The second generation of WeDo has been gracing elementary classrooms for the past two years. And this last spring, the WeDo 2.0 software received a nice overhaul. Read on for the rundown on this robotics classroom tool. The difficulty level of the open projects covers fifth grade science standards. What device do I need for programming the WeDo? Make sure you check out the Hardware Specs before you buy devices. Each of the projects has three phases. In the Explore phase, students connect to a scientific question or an engineering problem, establish a line of inquiry, and consider possible solutions. Next is the Create phase where students will build, program, and modify a LEGO® model. Last, each project ends with the Share phase. Students present and explain their solutions using their LEGO builds. The students document what they have created in the integrated Documentation tool in the software. Visit the great website provided by LEGO to get started. This quick start will get you unboxing your pieces, labeling your parts. and downloading the software. 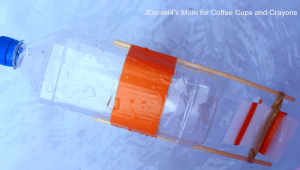 Try out a few of the Getting Started projects. These small builds will give you an idea of building and programming. 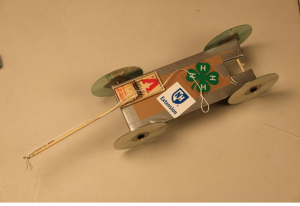 Create and program a race car to investigate what factors would make it go faster. Document and present ways to make their race car go the fastest. 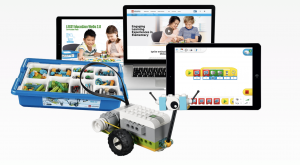 Hopefully this blog will get you started on the right track with WeDo 2.0. TCEA is offering a training on it on October 20, 2018. 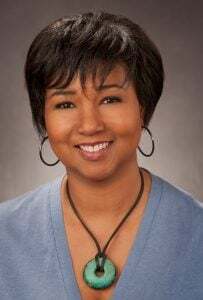 We’re so excited to announce that the opening keynote for the TCEA 2019 Convention & Exposition is the remarkable physician, engineer, social scientist, entrepreneur, educator, and wanna-be dancer Dr. Mae Jemison! Oh, and she also just happens to be a former NASA astronaut and the first woman of color to travel into space. Jemison is an advocate for STEM learning, and she has a powerful message to share with our 2019 attendees. Read on to learn a little about Jemison and why we’re thrilled to have her help get educators Fully Charged this February. You’ll also get a sneak peek at some of our other featured presenters. Mae Jemison is not someone who sees barriers or limits. She is continually looking for ways to expand what humanity is capable of and to encourage the next generation to push even farther. Jemison served as a NASA astronaut for six years. She traveled aboard the Space Shuttle Endeavour in 1992. She also started the Jemison Group, a technology consulting firm that develops engineering and science solutions to solve critical socio-cultural issues such as using satellite technology for healthcare delivery. Jemison is an inductee of the National Women’s Hall of Fame and the International Space Hall of Fame. She is also a winner of the National Organization for Women’s Intrepid Award. Jemison leads 100 Year Starship, a bold nonprofit initiated to ensure that the capabilities exist for human travel beyond our solar system to another star within the next 100 years. Of course, for these advances to happen, the next generation of learners will need to embrace STEM learning and STEM careers in a big way. Jemison has written several books to help make the ideas and concepts of the 100 Year Starship accessible to young learners. In 1994, Jemison founded the international science camp The Earth We Share. This camp is open to middle school and high school students and focuses on improving science literacy and problem-solving skills. The camp is run by the nonprofit Dorothy Jemison Foundation for Excellence, named for Jemison’s mother, a dedicated educator for 25 years. From 2011 to 2014, The Dorothy Jemison Foundation held the TEWS-Space Race which trained hundreds of middle school teachers and thousands of students in experiential science education. Jemison is herself an educator. She was an Environmental Studies professor at Dartmouth College from 1995 through 2001, where she worked on sustainable development and technology design for the developing world. Here are a few pieces of trivia about Dr. Jemison. Before she was an astronaut, she served as a Peace Corps medical officer in Sierra Leone and Liberia. She has also worked in a Cambodian refugee camp in Thailand. She played a role on Star Trek: The Next Generation. In fact, she was the first real astronaut to ever appear on the series. Jemison has a LEGO minifigure in her honor as part of the Women in NASA set. It was the fastest-selling toy in Amazon history. In addition to the incredible Dr. Mae Jemison, we’re thrilled to be welcoming several other featured presenters that will make the 2019 Convention one to remember. Gerry Brooks is an educator who is known for his hilarious, and all too relatable, videos on his popular YouTube channel. He will be bringing his best tips and tricks on how to foster a positive culture in your school or classroom. And, of course, he’ll make us all laugh! Leslie Fisher is a former Apple employee who now specializes in presenting emerging and practical technology solutions to educators all over the world. Shannon Miller is a Future Ready Librarian spokesperson working with students, librarians, and teachers to encourage conversations around education, technology, creativity, and student voice. new possibilities. Her interactive learning experiences incorporate technology, movement, and participant expertise. Sara Schapiro is the Vice President of Education for PBS and leads their efforts to engage with education communities to empower and support students, educators, and parents. She speaks about the transformation of education through innovation and technology. Catlin Tucker is a Google Certified Innovator who has written several books on achieving blended learning. She also runs an internationally-ranked education blog at CatlinTucker.com. These are just a few of the voices that will be helping educators to get Fully Charged this February. We hope you will be there too, ready to take in all that they have to share. Mark your calendars because registration opens September 13. See you in San Antonio! 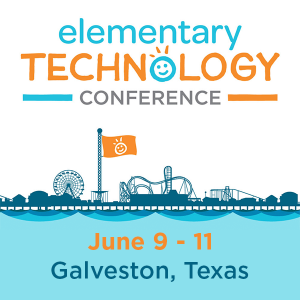 At the recent Elementary Technology Conference, one of my Code Building with Minecraft: Education Edition session participants asked, “Have you heard of CoSpaces?” I confessed that I had not. “It’s a way to introduce students to 3D printing design using block coding,” she responded. 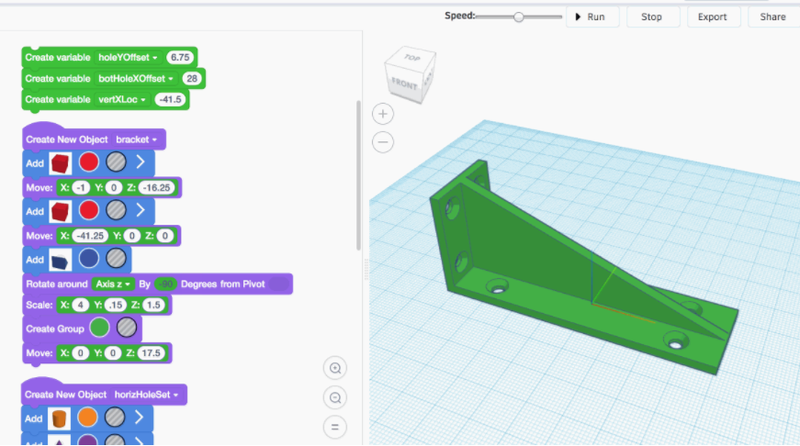 Intrigued, I made a mental note to explore this fascinating way to introduce students to coding and 3D printing design. In this blog entry, we’ll explore two tools, including one just released, that empower you and/or your students to use visual programming (a.k.a. “block code”) to create a 3D print design for printing. As I mentioned in a previous blog entry, Design Thinking Learning, presenting students with problems can introduce them to block coding. What’s more, it can serve as a way to make a real-life connection. Augmented Reality (AR)/Virtual Reality (VR) and 3D printing are two more exciting ways to create rapid prototypes of solutions to human-centered problems. Learn more about design thinking. Read this short overview. Are you ready to code creations that manifest themselves in augmented reality or virtual reality space? Check out CoSpaces; get an overview in this PDF document. Browser-based CoSpaces works online, so no special software is required. You are able to create in 3D, using block coding to add animations. Enroll in their free online course to learn how to create in CoSpaces. 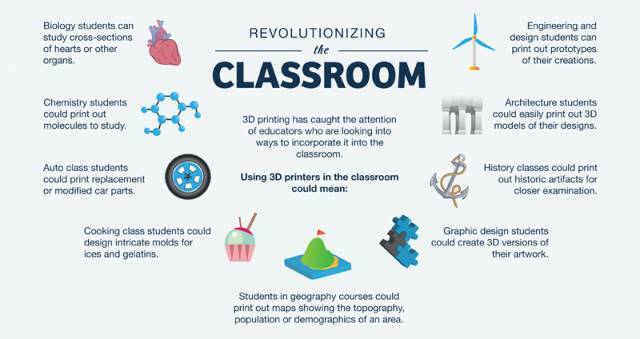 Want to learn more about what’s possible with CoSpaces in the classroom? Read this TCEA blog entry. You may already know about TinkerCAD as an amazing way to introduce students to 3D print design. 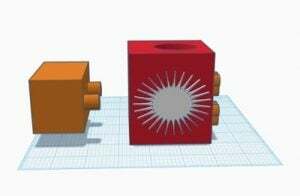 Students are able to design in 3D using a beginner tool before they move on to something like Photoshop, SketchUp Pro, etc. This means students can design and fine0tune their designs in digital space before they hit the “PRINT” button. 3D printing has long been a rapid prototyping tool. But what about creating 3D print design using visual programming code? Once students have created their code, they can export their creation as a 3D-printable file. 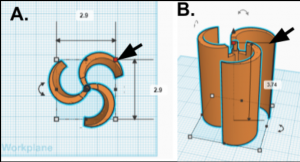 You can do more than just export your code-based 3D printing designs. You can also share them with others using the handy SHARE button. Whether students are coding to create in virtual/augmented reality or design in 3D, they are making important connections. One connection sure to engage them is that students see how code translates into physical creations. The coding process makes thinking visible. The visible creation (e.g. 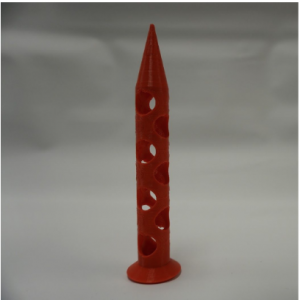 3D printed design) strengthens student understanding that what’s digital can be made physical. Or, to put it another way, thinking made physical. With the cost of 3D printers coming down and the quality going up, it’s no wonder that more and more folks are joining the 3D printing craze. Even if you are a novice at designing in SketchUp, Tinkercad, or Fusion 360, you can find tons of files already created and ready to be downloaded and printed. If you haven’t joined the 3D printing fun yet, then jump over and read our post Easy Answers to FAQs about 3D Printing to get started. 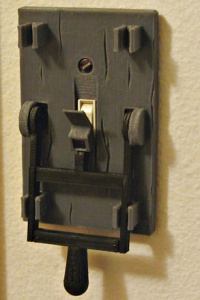 For some easy and fun 3D printing, I have pulled together a variety of light switches that you can download and print. Even if you don’t want to modify the files, you will find that you, and others, will get a smile each time you use your light switch. Above is the light switch that I modified for our type of plate at work. I set mine so that the switch is to one side in case I wanted to do something fancy on the other side. After you print one out, you will start having new ideas of how you can tweak it. If you plan to print out anything that LEGOs can snap to, be sure to print out a test file first and check to make sure that the pieces can snap on without crowding each other. Though you can create it from scratch, you might find it easier to start with a LEGO baseplate and then cut out the area for your switch(es). 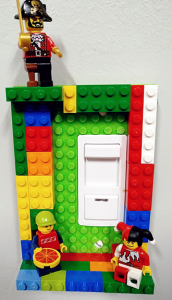 Here is a super simple wall plate for a light switch to start with. Even though it has ON and OFF lightly carved in it, you can easily fill it in to make a solid plate on which you can add text, objects, etc. 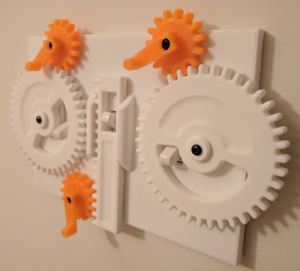 Even though this one doesn’t involve LEGOs, you will want to print the first one in draft or quick mode so you can verify that the screws and switch hole line up with yours. No need to spend several hours designing first only to find out later that they apparently have one that doesn’t meet the specs of yours. If you are into gears, then SRex has designed the Geared Light Switch Plate. This one is for the three-switch plate. Instead of flipping the switch, you crank the appropriate handle to turn the gear that moves the other gear plate to flip the switch. The nice thing about the two outer gears is that there is ample room if you wanted to add text or designs to the inner portion. 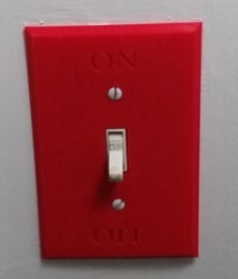 This is a great switch for a child’s room or the STEM lab. If you are a science teacher or English teacher, you might be interested in the Frankenstein Light Switch Plate by LoboCNC. Science teachers might like the electricity reference, while English teachers may enjoy just another reference to classic fiction literature. If you don’t have brown filament to use for it, then you might consider painting it before you assemble and install it. LoboCNC gives you several files so you can accommodate single, double, and triple switch plates, as well as one with a paddle-style rocker plate. 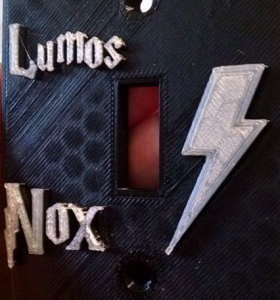 Harry Potter fans will enjoy the Harry Potter Light Switch Cover by momofthreeboys. No need for a dual extruder; just use black filament and then carefully paint the letters and lightening bolt with silver. This plate also has three hooks at the bottom (not shown) for you to hang your keys on…or your dragon leash or magic wand. Though I have not printed this plate, it appears that you might want to make the base slightly thicker so the supporting rafts are not apparent or just make sure the plate is solid and does not contain a hollow core. And no collection would be complete without a Tardis Light Switch by zerocool5878 for all the Dr. Who fans in your classroom or office. Of course you know you have to print some extras for the others to have in their rooms. 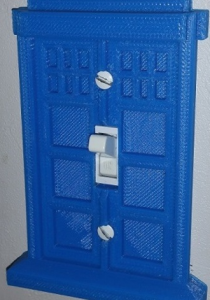 With just a little searching, you can find all sorts of matching Tardis projects to print. So which one will you print out first? I bet that if you put it in your classroom, your students will want one and your cool factor will go up a few digits! If so, let us know how it goes…and be sure to share a photo of your final project by emailing it to me at [email protected] or tweeting it out using the #TCEA and #makers hashtags. You could say we made this lesson up “on the fly.” I was looking for something fun and interactive and found an idea from Science Penguin on teaching a lesson on the paper airplane. The focus of the lesson was geared towards different variables that could affect the distance flown by the planes. Prior to building the planes, I accessed the students’ prior knowledge, and we discussed what variables could affect their airplane. We also talked about what forces affect flight. Students built their planes from two types of paper: notebook and copy paper. However, this lesson is very adaptable. You could definitely change it up and use different types of materials instead of just paper. To help springboard their ideas, I sent out a link in our Google Classroom to show different styles of paper airplanes they could construct. After all of the students had constructed their creations, we took them outside to test them. I demonstrated the process of throwing the airplane and then measuring with the measuring tape and Trumeter measuring wheel. Once we discussed the process, I let them work together in groups of three. The groups were a great size to foster communication and collaboration, but I needed more measuring tapes and more Trumeters. Some groups had to wait patiently for the tools while others were working. Once they took their measurements, they wrote down all of their data in their science journals. As some were finishing up, I briefly discussed with them about conversions because we were using centimeters, feet, and inches. You could definitely extend this lesson with more math conversion equations if you would like. You could also bring in different types of nonstandard measurement tools to further extend the learning. We had some students whose planes flew really well and we had others that flew terribly. In the moment, we discussed briefly why they thought the flight was successful or not. We had some great conversations about how different variables impact the outcome. Maybe next time, I would consider having them write about their plane’s experience and then try to problem solve how they could adjust their plane to help them fly even better. We then came back into the classroom and had a longer open discussion and reflection period about why their plane did what it did. We discussed the different variables at play in greater depth. We also talked about what they noticed during this experiment and how much force they used when throwing the plane. They also noticed that the people’s planes who flew the furthest were very aerodynamic. Some students tried different designs other than the basic paper airplane model and really enjoyed trying to be creative with their plane. Looking back, I wish we would have saved them and then flown them on a windy day to compare and contrast. This is a guest blog by Chris Ramos. Chris currently teaches fifth grade at Fort Sam Houston Elementary in San Antonio, Texas. You can follow him on Twitter @RamosFSHE or email him at [email protected]. You can’t change the weather, but you can change the world. And that’s exactly what these students are doing. 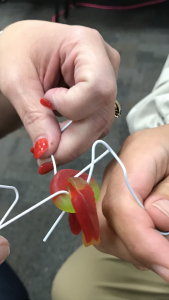 This year, the challenge posed by TCEA’s 3D Design Contest was how to design a 3D solution to a real-world problem associated with the weather. The goal of the contest is to let students be creators and so the students are the ones in charge of defining a problem and using the engineering design process to come up with a workable solution. From a more efficient wind turbine to grass stakes to prevent erosion following hurricanes, these students delivered with creativity and well-researched follow through. This year the contest had two categories: Intermediate (Grades 6-8) and Advanced (Grades 9-12). In addition to creating the actual product design, the students also kept a detailed log of their engineering process. They also created a marketing campaign to showcase their product’s value. Check out the top three winners in each category below and get to know their incredible ideas. The winning team from Lewisville ISD considered how the weather can inconvenience individuals who use a walker to get around. This makes it hard for them to hold an umbrella. The Design Thinkers were on the case! They created an umbrella holder that attaches to a walker, leaving those with mobility issues comfortable and dry. Flooding, like what occurred in the Houston area after Hurricane Harvey, can cause great devastation and the destruction of property. To help protect people’s homes and businesses from a sudden deluge, the team from White Oak ISD designed underground trenches and grates that could help drain water throughout a city. The team from Clint ISD also had hurricanes on the brain. However, instead of preventing the damage caused by a storm, they wanted to stop the storm in its tracks. After researching to learn that hurricanes can only continue to gather strength over waters that are 79 degrees or warmer, they designed a device that would fly over the water, sprinkling water droplets to cool the surface directly in the path of the storm. us. West Texas is a great location for potential wind energy. However, current wind turbines don’t capture it as efficiently as they could. Their design “integrates the gravitation water vortex power plant design with a basic Persian windmill design” for peak performance and less of this valuable alternative energy wasted. In yet another thoughtful response to considering how to limit the impact of large-scale storm systems, the team from Brazosport ISD designed a tool to replace plants drowned by flood waters and prevent erosion on river banks. They designed grass stakes from a material that is easy to 3D print, but also dissolves in water. The stakes can be used to plant seeds for erosion-resistant ground cover. The team from Plemons-Stinnett-Phillips CISD focused on a problem facing much of Texas in the dry summer months: the spread of wildfires. If indoor sprinkler systems can detect fires and save properties, why couldn’t an outdoor sprinkler system do the same thing? Their 3D design uses pop-up sprinkler heads with fire-detecting technology to prevent wildfires from spreading to people’s properties, saving both homes and lives. At TCEA, we want to give a big congratulations to all of the teams and their sponsors who entered our second annual 3D Design Contest. We were blown away by the incredible ideas these students had for combating some pretty big problems. Do you have a team of STEM problem-solvers ready to change the world? Find out more about the 3D Design Contest and how you can enter a team next year here.